The Today’s Mom Cozy Comfort Pregnancy Pillow is perhaps the most comfortable maternity pillow available for pregnant women. As a Certified Midwife, I highly recommend this pillow to any expectant mom who is having a hard time sleeping at night. 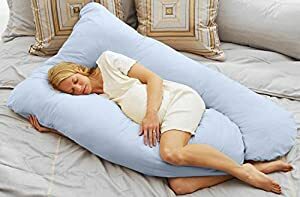 The best part about this pillow is that it can also be used once the baby is born. One of the best features this pillow offers is support. The Cozy Comfort Pregnancy Pillow provides excellent back and belly support for expectant mothers because of its nice inner curve. How this pillow works is by cradling all of the natural curves of the body to help keep mom comfortable while she sleeps. The Cozy Comfort Pillow also offers back support for mom, as well as supporting the baby while mom is nursing. One of the biggest complaints I get from expectant mothers is how hard it is to get comfortable enough to go to sleep during pregnancy no position seems to work. The Cozy Comfort Pillow goes from the shoulder down to the legs, so the whole body is supported, not just the back and belly. Offering a full-length pillow for mom to use during pregnancy is nice because it keeps the entire body comfortable during a very uncomfortable time. In essence, this product is a large pillow designed to give comfort and pain relief to pregnant women. It does this by providing a shape that the woman can wrap around her body. It’s often difficult for pregnant women to find a comfortable position to sleep, but thanks to Today’s Mom Cozy Comfort Pregnancy Pillow, that just got a little bit easier. Meanwhile the inner curve of the pillow supports the back and belly during pregnancy. This support not only provides comfort but also prevention of a number of key health issues that can arise during pregnancy, including breathing problems and back pain. There’s no guarantee that the pillow will completely rid you of your pregnancy ailments, but it should go some way to help in the process. The average pillow remains rigid in shape and can therefore stick into your body and cause further pain. On the other hand, this pillow is designed to slot into your body, like a jigsaw piece. The pillow is incredibly light, weighing in at only 2 pounds and in terms of dimensions, is sized at a pretty large 56 x 9 x 32 inches. The product’s large size is definitely compensated by its incredibly light weight. Available in a number of neutral colours that comfortably complement the design of your living room and home. In conclusion, many of the pregnancy pillows out there are just simply too small. However, the Today’s Mom Cozy Comfort Pregnancy Pillow definitely doesn’t suffer from that problem. Generally speaking though, this is a great quality product and one that will certainly provide a good level of comfort during your pregnancy.